On Xbox One, this game is simply known as Hover. When it released on PC last year it was known as Hover: Revolt of Gamers, which burns my ears whenever I hear it. In dropping everything after the colon, the game now releases on consoles bringing its oppressive yet colourful open-world with it, and a much less offensive name. 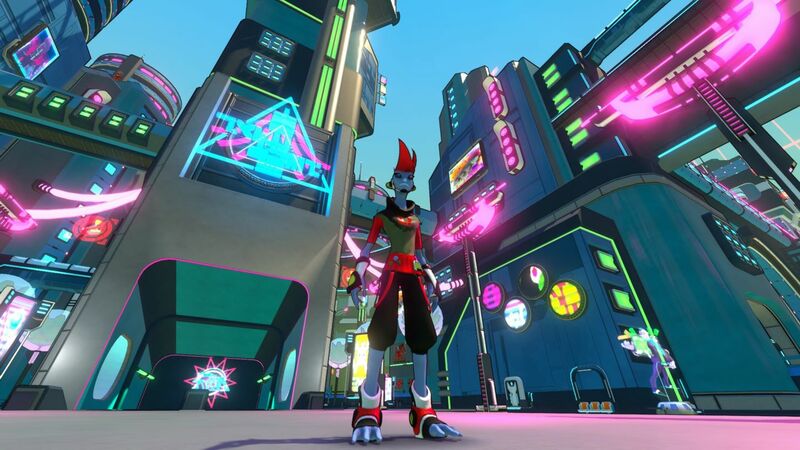 At first glance, Hover looks an awful lot like that of Jet Set Radio and when you hear the music kicking in, you’d be forgiven for thinking it is an identical clone entirely. 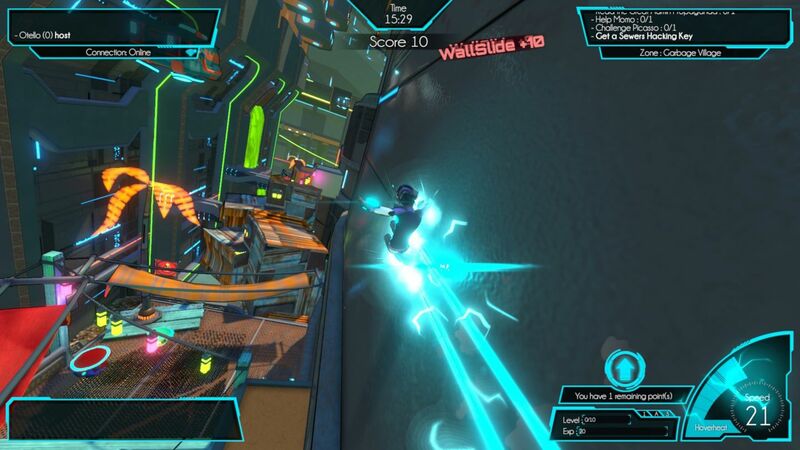 The truth is, Hover is an homage to Jet Set Radio, featuring the same bright visuals and gameplay that came before it, and even going as far as employing Hideki Naganuma – lead composer on JSR – to contribute to Hover’s soundtrack. And what a good soundtrack it is, featuring motivational beats to get you jacked up for a race yet also able to take on a more chillout vibe when just exploring. But Hover takes the fluid inline skating and graffitiing of JSR and introduces that into an open-world environment. The result is one of the most interesting open-worlds I have ever explored. Hover takes place in ECP17 – AKA Hover City – in a world governed by a group called The Great Admin. They have outlawed every kind of fun and entertainment, for reasons unknown. You create a character who joins up with a group known as the Gamers, tasked with vandalising and sabotaging propaganda, helping citizens and above all, having fun and showing others the same. The main hub is completely open after completing the tutorial and features many NPCs, all offering quests. These quests can vary from races to chases and even a few multiplayer ones – more on the online component later – but what the actual quest alludes to is never really known until the mission starts. If it is a race for example, it may convey it as some kind of timed event through ‘banter’ between the supporting cast, but it certainly doesn’t let you know which way to sprint when the race starts. Another mission would have granted me a key card to move to the next area but that was the only information I was given; if it hadn’t been for the arrow pointing towards an enemy on the other side of the map I would never have known. Thankfully the missions aren’t all that difficult, but they are confusing. Certain missions involve playing a game with a ball cleverly called ‘Gameball’. Two teams fight for control and must deposit it in the goal of the opposition. The venues can vary from a standard Gameball court to a long corridor of sewage or an old unused storage room; the point is – as these Gamers are trying to have fun – it can be played anywhere, and by anyone. Anyone being both AI and player-controlled, as Hover is fully playable online, almost like an MMO. Players from both console and PC will populate the world as fellow Gamers and can partake in the same missions as you, at the same time. This means races and Gameball games, but it also means that any missions currently being undertaken by someone else in your game instance cannot be completed by yourself until they are finished. It’s great to have this online component and really adds a personality, but there are a few parts of it that don’t run as smoothly as other MMOs. I must also point out that the community in Hover is exceptionally friendly and I was made very welcome in Hover City. Even when my complete lack of skill was made very apparent during a Gameball game, I never received abuse, only helpful pointers. That in itself is such a refreshing change. Movement is also heavily inspired by JSR, with a lot of focus on momentum. 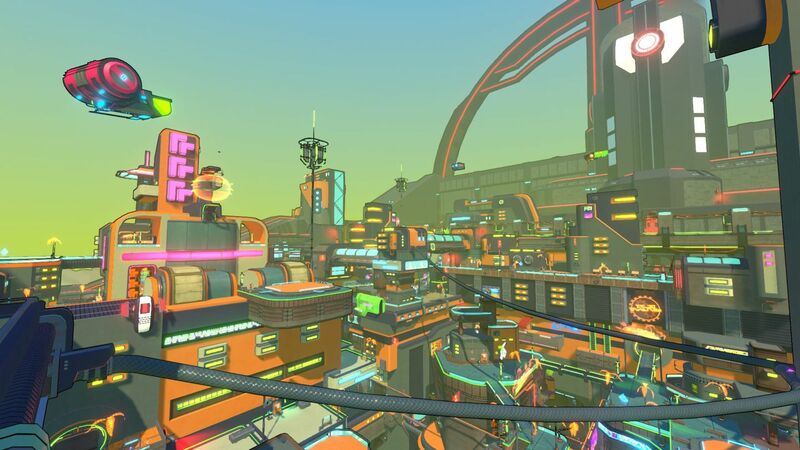 Hover City features hundreds of different levels to jump on, grind rails, ramps and boost pads to help you navigate the city from top to bottom. And once you get the hang of it, Hover presents a fantastic world to explore, brimming with activities and items to find. The world is full of neon illuminating the skyline and really is full of life. In the early stages, it can feel like you are lacking enough oomph to reach the peaks of Hover City, and that’s why Hover features upgrade chips that can be unlocked as you progress through the levels. Chips can be found hidden throughout the world or given as mission rewards; the better your performance, the better the rewards. Also hidden deep in the ‘Menu of things that aren’t really explained’ is a Codex. Here is where you will find tutorials on what to do in the game, and a lot of info on the world itself. It’s very much like the Codex in Mass Effect, it contains all the lore for the game and is optional as to whether you want to delve into it or not. You could quite easily spend hours trawling through it all, it is dense. There is also a map to be found but honestly, a 2D map of a 3D landscape where most of the world is on the Y-axis offers no help whatsoever. For all the in-game lore and activities to do though, the game frequently tries to pad out the length by blocking progression by only allowing crucial story missions after you have reached a certain rank. These ranks are separate from your level – which caps at 10 – and go into the hundreds. You earn ranks for completing any sort of objective whether it be destroying a propaganda neon sign, graffitiing, picking up a collectible or completing a mission. However, even with this abundance, there are moments the required rank will be far larger than your current and requires you to delve back into the sub-quests for a long time before allowing story progression. And just over half way through the game, Hover introduces a stealth section which goes against everything you’ve learnt so far and becomes an exercise in patience rather than an enjoyable diversion. Doing a 180° flip from building momentum and chaining movement together to a slower, stealth section doesn’t work in this situation. There are 12 achievements in Hover and are some are for story progression and finding points of interest in the world, but others are trickier. Arguably the most difficult is for finding all the Gamegirls (a play on the Nintendo Gameboy and a hidden handheld console, not an actual hidden girl gamer) in the world – some 200+ – and completing the main game to get the secret ending. It will require every hop, skip and jump to find them all. Also dotted through the world are several easter eggs and nods to pop culture; throughout my time I noticed a suspicious looking police box and a doll that looked a lot like Bender from Futurama. Hover is a great game if all you want to do is chill out and relax. The main, central district can be explored for hours and you still won’t discover everything, and if you play it online there is a great community to play and compete with. If you want to focus on the story though, it loses its charm as you suffer through repetitive looking areas and missions that bog down the whole experience. There is a lot to uncover, and the story does go quite dark at times – brain harvesting for example is referenced – but Hover is most fun when it is at its purest; a big city to explore and jump through.